When we first started looking at houses, dining rooms were not high on my list. In fact, they weren’t on my list at all. Open floor plan, yes. Bathtub and large closet, absolutely. Dining rooms? Who needs them. As long as we had an eat in kitchen, I was pretty content on no dining room. Boy, was I wrong! This room has quickly become one of the most exciting rooms in our home. I loved decorating it and I am even more excited for all the memories that will be made in here soon. I’m not 100% done in here, I need some art work behind the table and I have my eye on a new fixture but we’re so close and just in time for the holidays! First, I wanted to give you the little tour of our dining room. Just like the memories that will be made here one day (very soon! ), it’s filled with lots of memorable pieces which makes me very happy. Being a room that’s not used frequently, I felt it was safe to stock it up with some pieces that had a lot of value. Our blue hutch is an antique from my Mom. I was so surprised when she offered it to us because I know it’s one of her favorite pieces too, but I don’t feel guilty about taking it because it gets good use here! In the hutch, we house family china. It was actually a wedding gift from my sweet stepdad’s parents which I think honestly means more than a family heirloom from my biological family. It means so much that they think of us as true, true family to them! Not to mention the china is absolutely stunning. It is originally from France in the 1800’s! Our table is new! A sweet gift from my Dad and Melmama, I am absolutely obsessed. I love the curved detail on the legs. When we were looking at tables it was surprisingly hard to find one with curved accents that wasn’t an extremely large amount of money. This table is so sturdy and I know it will be in our family for years to come. I wanted to do something a little different with the chairs and ultimately decided on this high back bench, statement end chairs and adorable farm house chairs. 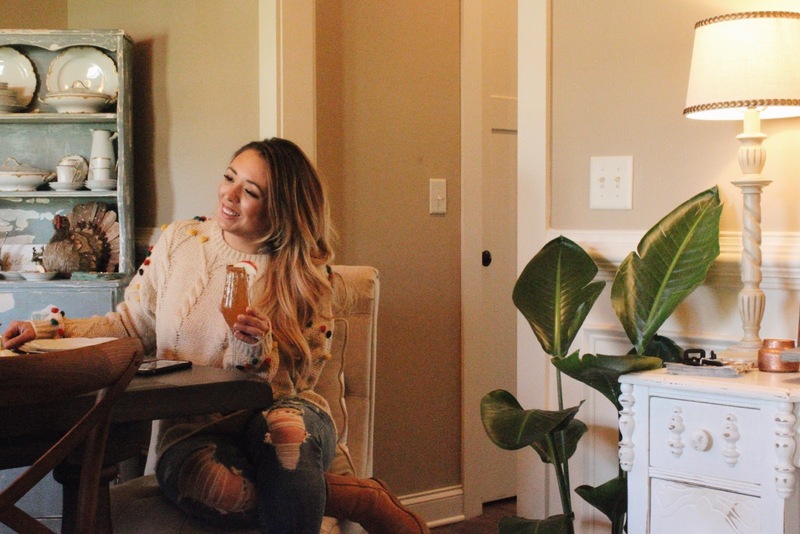 I didn’t want Thanksgiving to feel left out as a holiday and what a better space to go all out for your Thanksgiving decor?! I am loving these wooden pumpkins (from Home Goods) and knew I would start with them as a base. 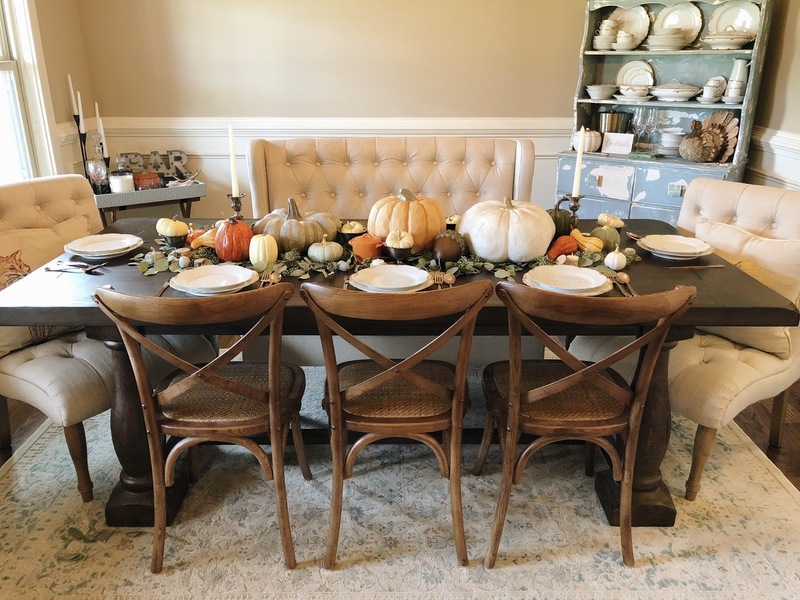 I filled in the spaces around it with some ceramic pumpkins and gourds (from Target) and I added a touch of traditional with some antique silver candle sticks and dessert bowls filled with pumpkins. I finished everything off with a bundle of Eucalyptus (from Trader Joe’s). It’s the perfect balance of glam and farmhouse that I love! We’re hosting Friendsgiving this weekend and I can’t wait to whip up these Caramel Apple Mimosas for our friends. They’re cheap and easy + so, so good. We served Apple Cider Mimosas during our wedding ceremony and it always reminds me of our special day. I think I’m extra nostalgic because our first anniversary is in a week! 6. Top with Apple Cider, garnish with apple slice or cinnamon stick & enjoy! **If you wanted to be lazy, these are just as good with champagne and apple cider but the rim is so fun for a holiday get together! ps. If you’re looking for something to wear for Thanksgiving, I love a large statement sweater paired with leggings or comfy jeans. It’s fun for the holidays but doesn’t require a lot of effort! 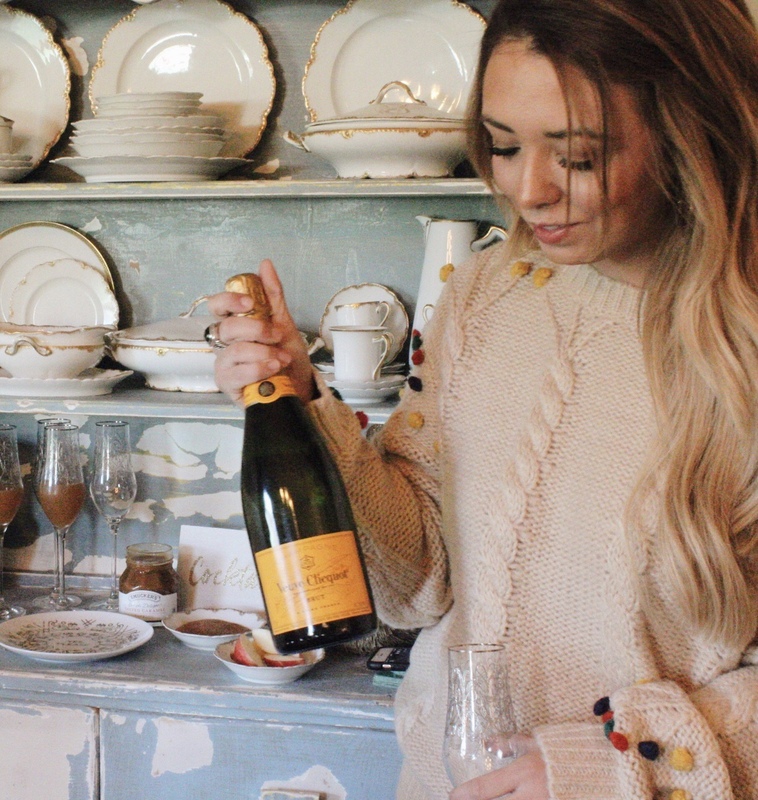 A fun sweater is especially great if you’re hosting because you still feel dressed up (even if you feel like you’re in your pjs). Previous Post Upgrading a Traditional Tree: Flocking & More for $5!